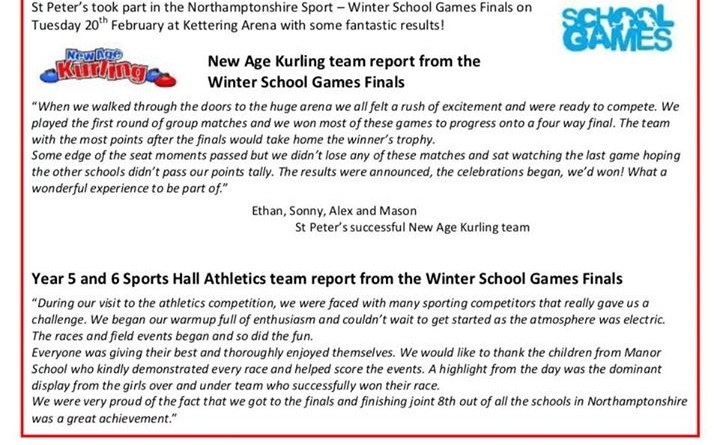 St Peter’s took part in the Northamptonshire Sport – Winter School Games Finals on Tues 20th Feb at Kettering Area with some fantastic results! “During our visit to the athletics competition, we were faced with many sporting competitors that really gave us a challenge. We began our warmup full of enthusiasm and couldn’t wait to get started as the atmosphere was electric. The races and field events began and so did the fun. Everyone was giving their best and thoroughly enjoyed themselves. We would like to thank the children from Manor School who kindly demonstrated every race and helped score the events. A highlight from the day was the dominant display from the girls over and under team who successfully won their race.